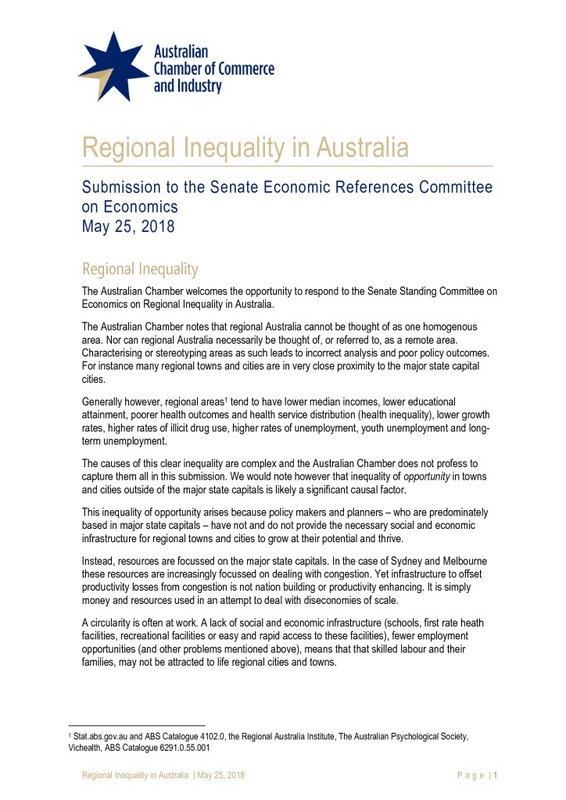 See below for submissions related to economics. 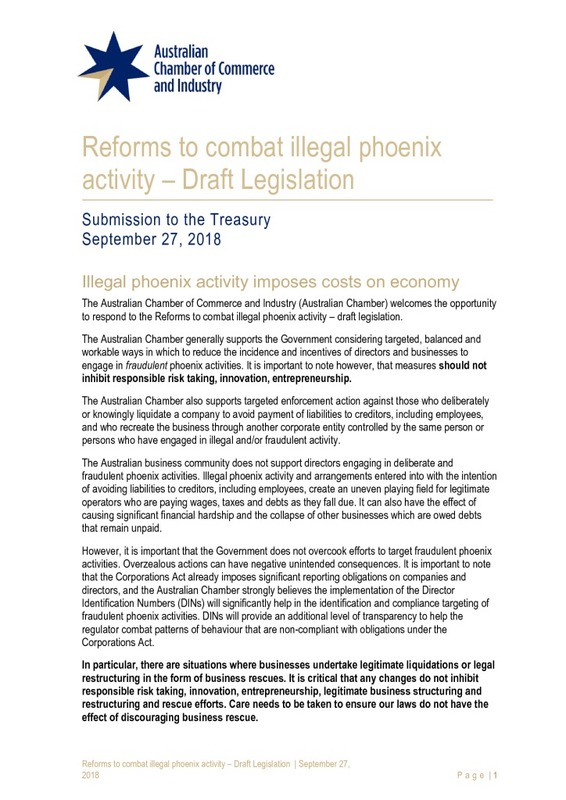 The Australian Chamber generally supports the Government considering targeted, balanced and workable ways in which to reduce the incidence and incentives of directors and businesses to engage in fraudulent phoenix activities. It is important to note however, that measures should not inhibit responsible risk taking, innovation, entrepreneurship. Care needs to be taken to ensure our laws do not have the effect of discouraging business rescue. 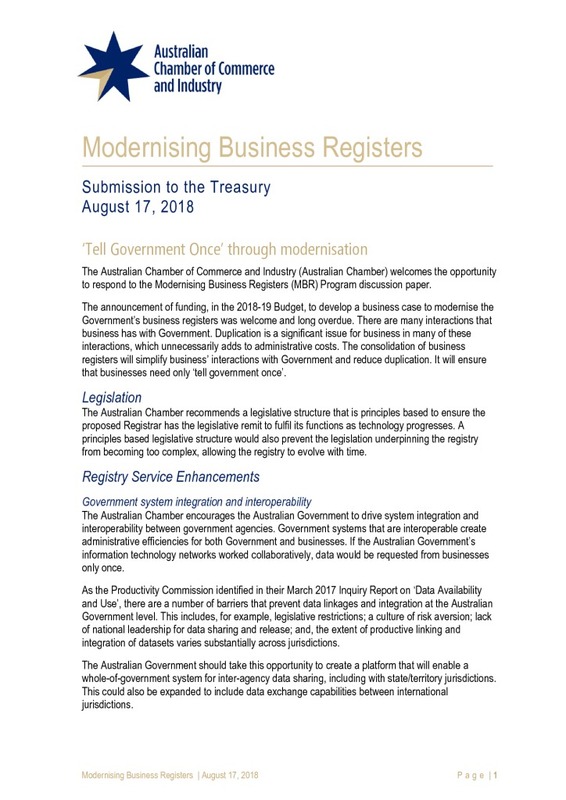 The Australian Chamber has been supportive of the Australian Government’s expansion of its open-data policy. Australian businesses are increasingly data-driven in their decision making and benefit from access to more complete datasets. However, there is more that can be done. 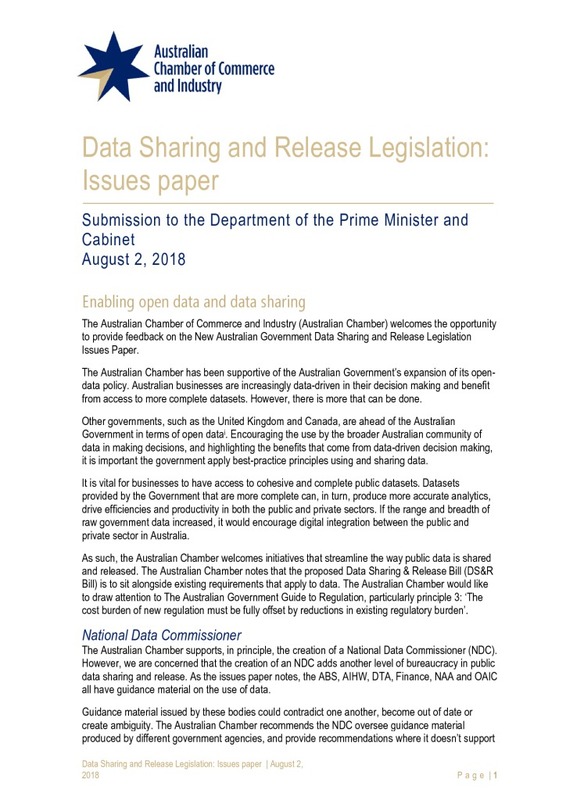 Other governments, such as the United Kingdom and Canada, are ahead of the Australian Government in terms of open data. 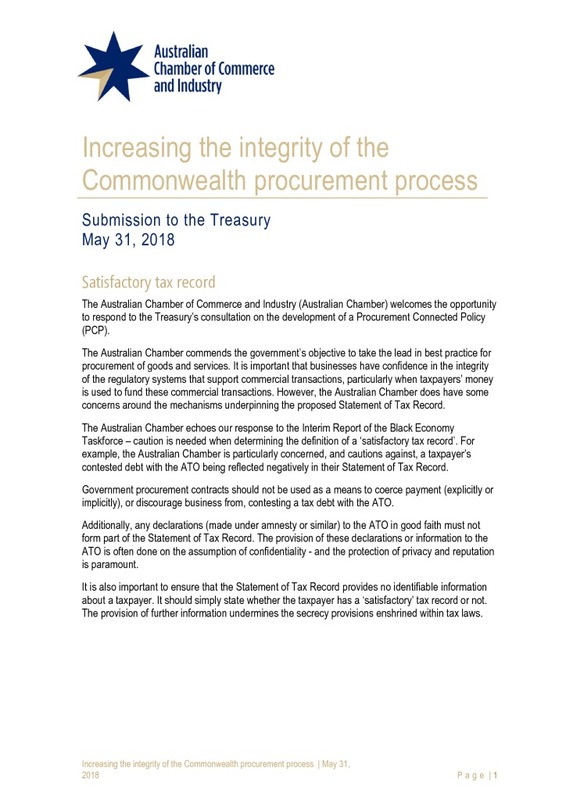 As such, the Australian Chamber welcomes initiatives that streamline the way public data is shared and released. The R&D tax concession was first introduced in 1985 with the aim of encouraging Australian industry to undertake R&D activities. Since then the R&D tax provisions have undergone a number of significant changes. 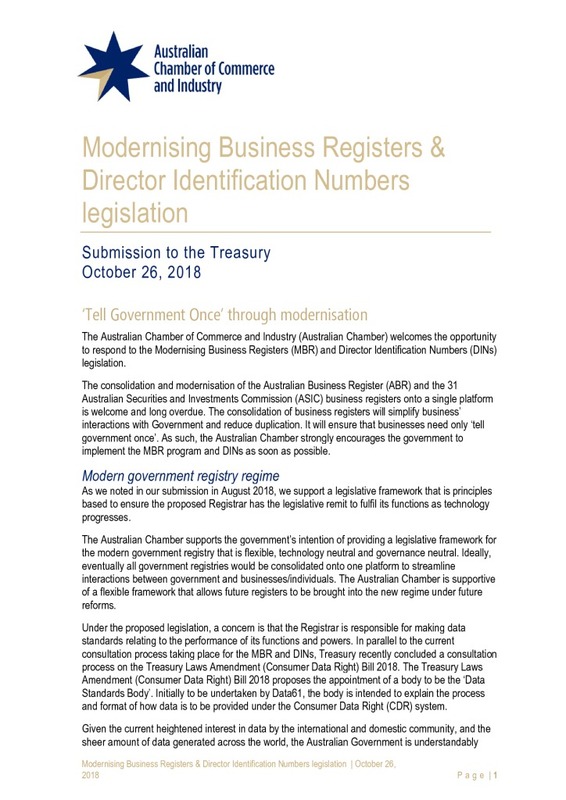 The constantly changing R&D landscape creates additional administrative and compliance costs for Australian businesses. 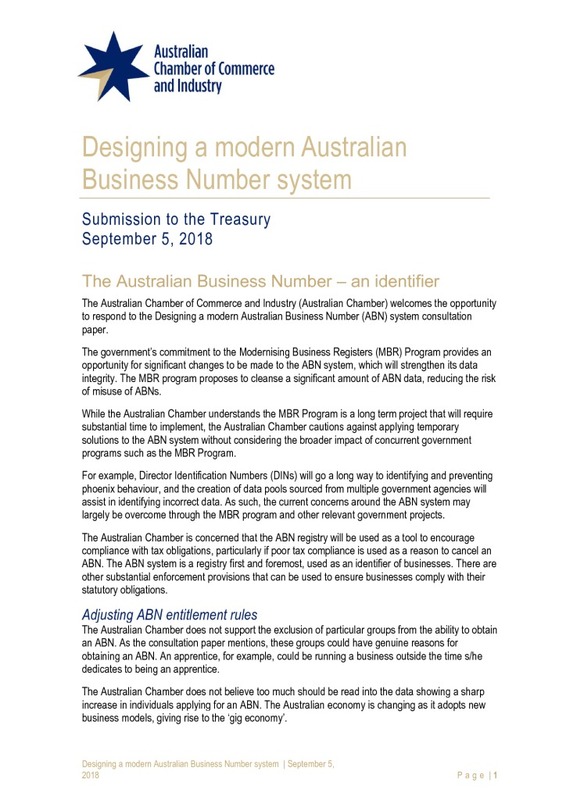 Consistency in R&D tax policy settings provides investment certainty to businesses. 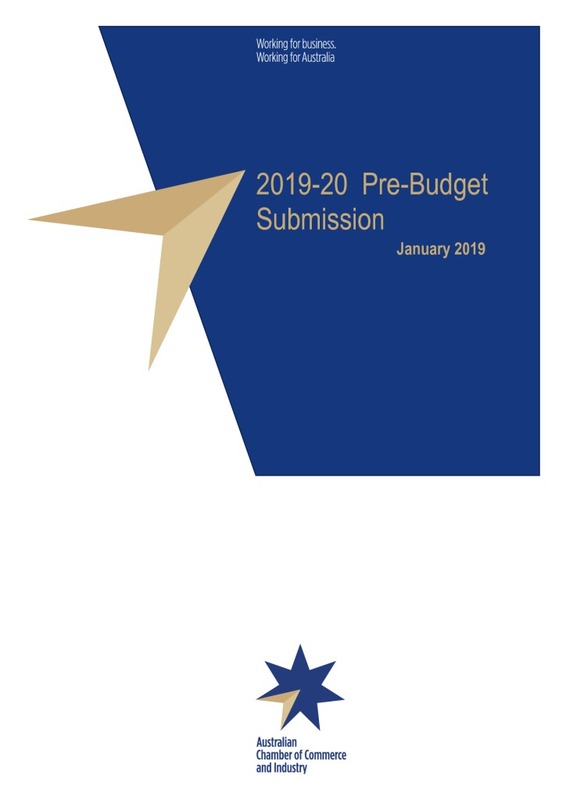 In particular, the Australian Chamber called for greater provision for R&D to lift investment and innovation in our Pre-budget submission for 2018-19. 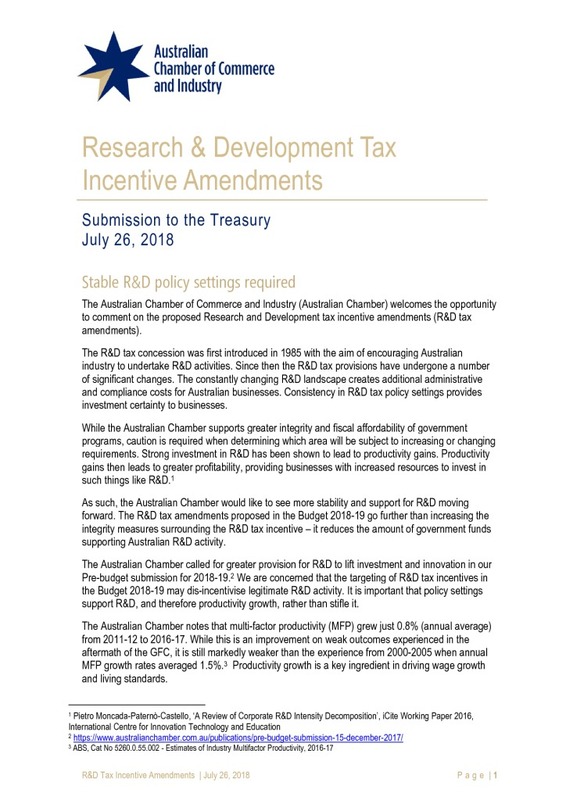 We are concerned that the targeting of R&D tax incentives in the Budget 2018-19 may dis-incentivise legitimate R&D activity. It is important that policy settings support R&D, and therefore productivity growth, rather than stifle it. 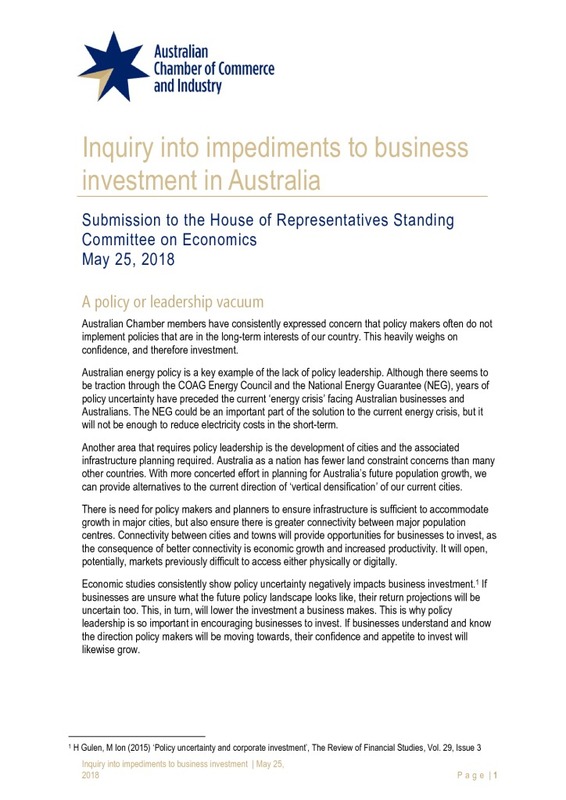 Australian Chamber members have consistently expressed concern that policy makers often do not implement policies that are in the long-term interests of our country. This heavily weighs on confidence, and therefore investment. Economic studies consistently show policy uncertainty negatively impacts business investment. If businesses are unsure what the future policy landscape looks like, their return projections will be uncertain too. This, in turn, will lower the investment a business makes. This is why policy leadership is so important in encouraging businesses to invest. 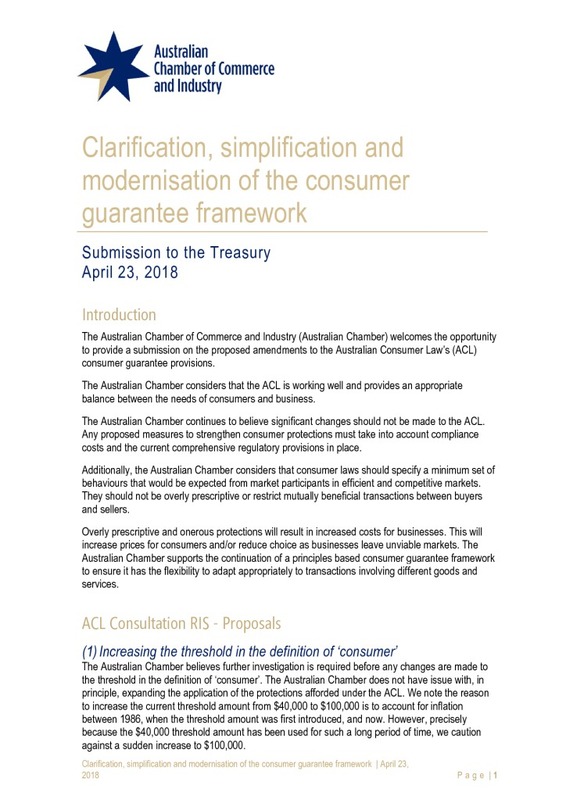 The Australian Chamber considers that the Australian Consumer Law (ACL) is working well and provides an appropriate balance between the needs of consumers and businesses. 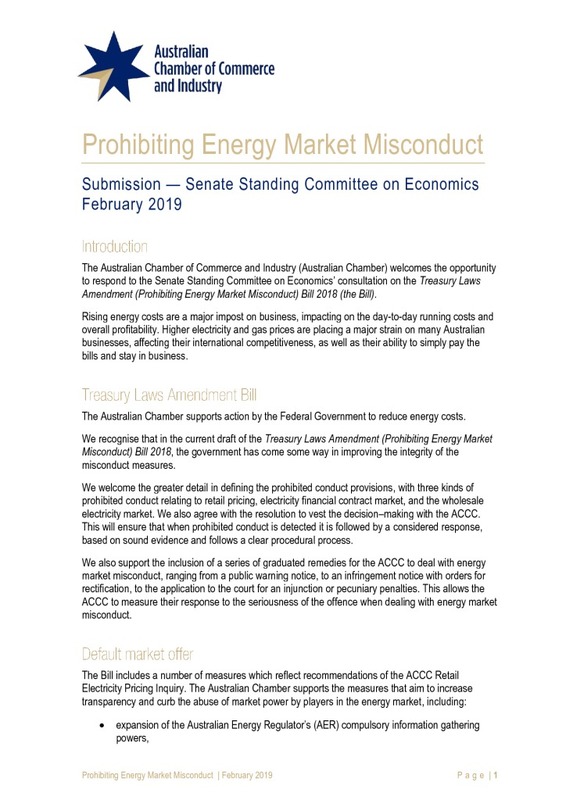 The Australian Chamber continues to believe significant changes should not be made to the ACL. The ACL should not be overly prescriptive or restrict mutually beneficial transactions between buyers and sellers. Overly prescriptive and onerous protections will result in increased costs for businesses. This will increase prices for consumers. 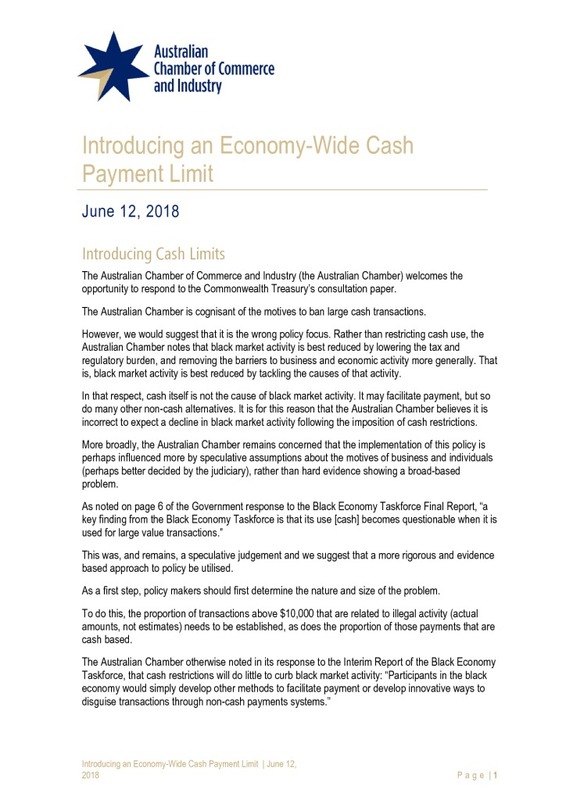 The Australian Chamber supports the continuation of a principles based consumer guarantee framework to ensure it has the flexibility to adapt appropriately to transactions involving different goods and services.